As per the Order, no person shall manufacture or store for sale, import, sell or distribute goods which do not conform to the Indian standard specified in the order. Manufacturers of these products are required to apply for registration from Bureau of Indian Standards (BIS) after getting their product tested from BIS recognized labs. 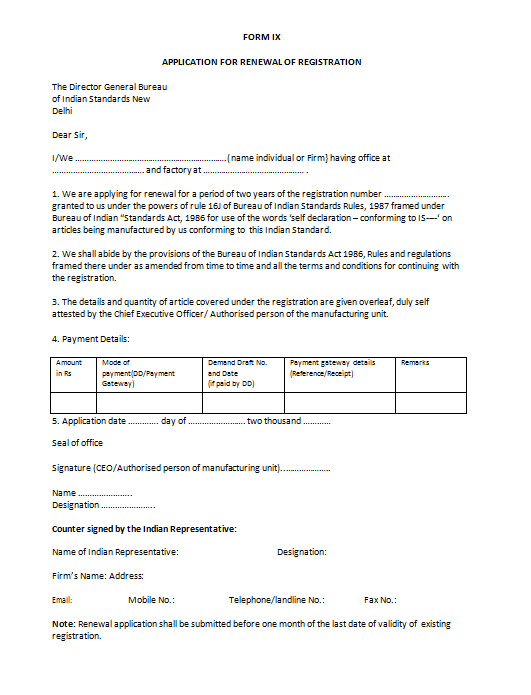 Bureau of Indian Standards then registers the manufacturers under its registration scheme who are permitted to declare that their articles conform to the Indian Standard (s). The registered manufacturers are then allowed to put the Standard Mark notified by the Bureau. Compulsory Registration Scheme is operated under Scheme - II of BIS (Conformity Assessment) Regulations, 2019. Now we provide this standardized BIS Form IX (for renewal) template with text and formatting to help you finish your document faster. If time or quality is of the essence, this ready-made template can help you to save time and to focus on what really matters! Don't try to reinvent the wheel every time you start to work on something new! Download this BIS Form IX (for renewal) template now for your own benefit now!